A stray gray hair, a trip alone, tax forms, paychecks and bills with my name printed on them – all of these combined could not have succeeded in making me feel all grown-up as this singular culinary act involving a particular vegetable did. Here’s what happened. Today, I did the unthinkable. Today, I willingly (yes, under no particular pressure whatsoever – except for the occasional health advice from mum which I am totally used to) bought bitter gourd (karela in Hindi). And no, instead of letting it rot in the refrigerator so that I could throw it out, I, voluntarily prepared them as a side dish for lunch. Yes, that’s the unimaginable thing that I did. And this maiden experience was no short of a jolt. As I watched the chopped pieces of bitter melon taking on a dirty brown tinge from their original dirty green color, scores of childhood memories ran through my (now possibly grown-up) mind. Since childhood, we kids were coaxed and cajoled into eating a few, if not more, pieces of this extremely bitter vegetable. The adults would tout it as a panacea for all health problems and my cousins, Di (my elder sister) and I would employ a variety of tantrums and protests to squirm out of this most unwelcome situation. And no, we weren’t being over dramatic – this thing really has the ability to ruin the taste of your mouth for a good few hours. Trust me – its horrible juice and texture work in unison to do extremely unpleasant things to your tongue and food pipe and stomach and makes you feel as if they had all been burnt and scoured and poisoned. Yeah, this vegetable single-handedly annihilates every single aspect of gastronomy. This was a recurring reason for standoffs in my home – with my dear mum on one side and my Di and I on the other side. To get past this impasse, some heavy duty negotiations would ensue and both the parties would engage in extended discussions to try and gauge the other party’s BATNA (Best Alternative to a Negotiated Agreement). 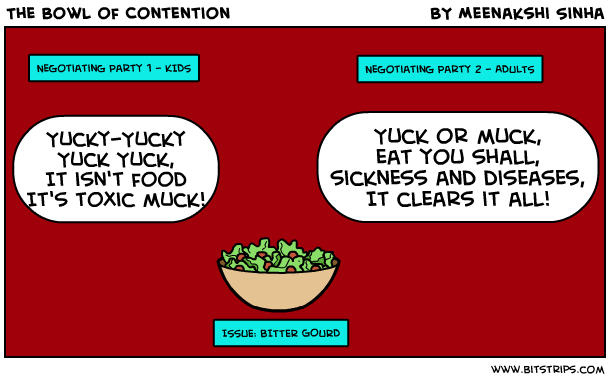 All this conflict and drama usually ended with Di and me hastily swallowing 1/2/3/4 (depending on our combined negotiation skill of the day) pieces of this alligator-looking, toxic-tasting vegetable and then stuffing our mouths with chocolates to soothe our pained palates. On days when my mum did not have the time to counter our sophisticated logic on this topic, she would sneak a few littles pieces in the lentil bowl or under the little pile of rice. Later, she would simply dismiss it as a mistake on her part and would offer us chocolates and kisses to make up for it. Of course, we couldn’t say no to either of those. But we would be sure to be on the lookout for stray pieces of karela in our food for the next few days. This being one of the major and recurring struggles of my happy childhood, I found it mind-boggling that the adults would treat this crocodile-skinned, inedible thing as just another vegetable, and looked forward to consuming it (convinced beyond any doubt that it was the best detoxifier in the history of detoxifiers). The only explanation I could come up with was that the taste buds of grown-ups behaved and reacted to tastes very, very differently than those of the little people. Whoa, that was one strong bout of nostalgia, isn’t it? Okay, back to the present now. So while I was thinking about all this, the bitter melons got cooked and were ready to be consumed. I admit being generous with the oil, spices and onions to make it swallowable because I still think that this vegetable was labelled as edible through some unfortunate accident. But the fact that I conceded to voluntarily pay for this stuff and to bring it in my happy little kitchen and to clean, chop and cook it made me feel all matured and sensible and ready to make big decisions and to take on the challenges of life! What? Did I hear you ask how it tasted? Well, how am I supposed to know that? If you think I would put a single piece of this rugged, rubbery thing in my mouth without being pressurized or fooled into doing so, you certainly have another think coming. But Gunjan did say he enjoyed it very much and would love it if I were to prepare it again 🙂 That’s what he said! I can certainly tell you that I will deign to indulge his request once in a while – because who knows, maybe it really is the best detoxifier in the history of detoxifiers. But I can’t tell you if the taste buds of grown-ups react differently to this bitter melon than those of the little ones; having not tasted it at all, I wouldn’t know!